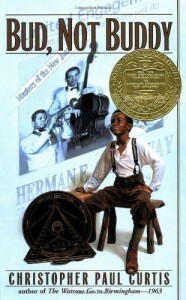 Bud, Not Buddy is a story about a young orphaned African American boy in Flint, Michigan during the Great Depression. His mother is dead and he doesn't know where his father is, until a seed gets planted into his mind that his father must be the man on the flyers that his mother saved. Bud runs away from his orphanage after spending one night with a particularly nasty foster family, and heads for Grand Rapids, Michigan in search of his father. When he arrives, the man, Herman E. Calloway, is much older than Bud anticipated, but the band that Calloway leads takes Bud in anyway until they can figure out why he thinks Calloway is his father. In the end, everyone figures out that Calloway is Bud's grandfather, his mother's father. This book would be appropriate for fourth or fifth graders. There are several topics throughout the book that could lead discussions many directions, such as diversity, history, family structures, and important possessions, to name a few.